Founded by Michelle LaFoe and Isaac Campbell, OFFICE 52 Architecture is a design firm that envisions transformative projects with the integration of architecture, innovative technology, and artistic expression for creative solutions. We express spatial ideas—not just in compelling, large-scale building projects such as the award-winning Nano-Bio-Energy Technologies Building, named Scott Hall, for the prestigious College of Engineering and the Wilton E. Scott Institute for Energy Innovation at Carnegie Mellon University—but also in smaller projects such as cultural and civic buildings, as well as more playful museum installations that draw inspiration from line, form, composition, volume, and the art of light and shadow. At all scales, our versatility in a variety of materials with attention to tectonic details and emphasis on ecological prudence provides opportunity to create rich spatial experiences in regard to the reality of each location. Office 52 Architecture, headed by founding principals Michelle LaFoe and Isaac Campbell, is a Portland-based studio working at the intersection of architecture, innovation, and artistry. 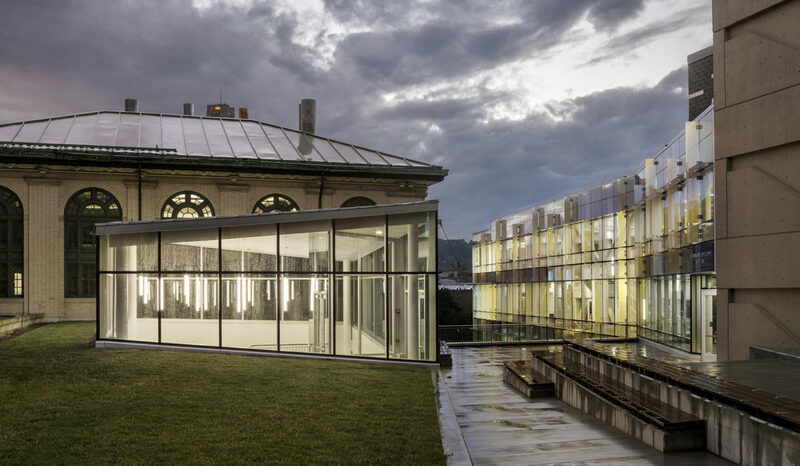 Look to its award-winning Scott Hall structure at Carnegie Mellon University (which was recently the subject of a monograph called _Form and Dichroic Light_) for an indication of its work: at once cutting-edge, imbued with scientific principles, and jaw-droppingly beautiful. Scott Hall is the new LEED-Gold certified 109,000 square foot Nano-Bio-Energy Technologies Building and interdisciplinary research center for the prestigious College of Engineering and the Wilton E. Scott Institute for Energy Innovation at Carnegie Mellon University - a commission our design team won in a national competition. 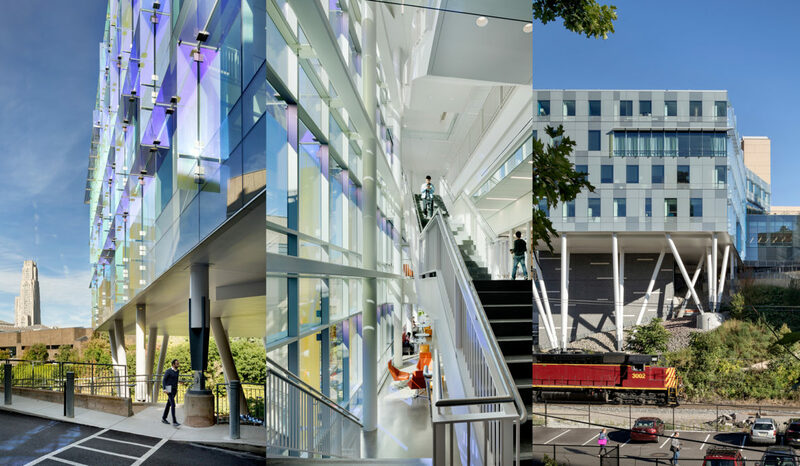 Art and Architecture are never entirely separate and the boundaries between the two are quite fluid, and this is the case with the innovative curtain wall we designed for Scott Hall at Carnegie Mellon University. The façade serves a functional and technologically sophisticated purpose yet exhibits artistic expression with interwoven elements of dichroic glass and ceramic glass frit in a composition that converts light into an active element in all lighting conditions with color and perceived depth. 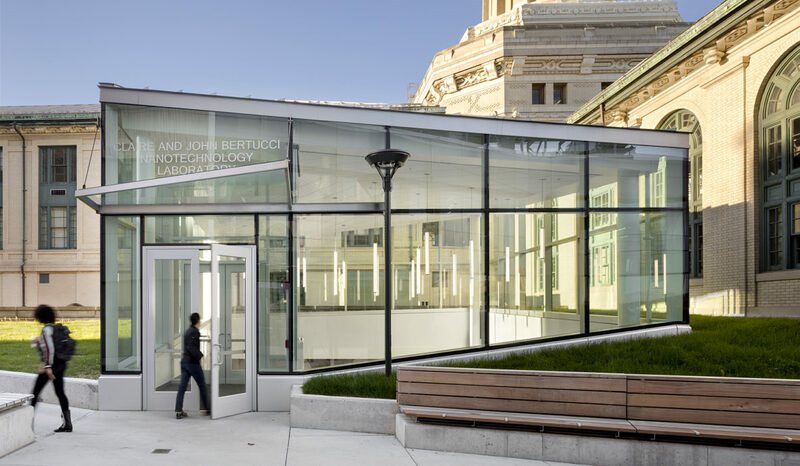 The Bertucci Nanotechnology Laboratory Entry Pavilion at Scott Hall, the new Nano-Bio-Energy Technologies Building for the College of Engineering and the Wilton E. Scott Institute for Energy Innovation at Carnegie Mellon University. To achieve LEED BD+C Gold certification, all materials/resources and building systems enforce carbon reduction strategies, reduce energy consumption and improve indoor environmental quality with use of regional and low-emitting materials and recycled content, in addition to continuous air filtration systems, exhaust air heat recovery, demand-controlled ventilation systems, cascaded water loops, water-cooled lab equipment, and high efficiency interior lighting. Ecologically sound material choices include masonry, glass, steel, concrete, carpet, paint, ceiling tiles, ceramic tile, doors and window treatments. Water conservation highlights the new 35,000 square foot state-of-the-art green roof atop the Bertucci Wing to collect storm water for high-capacity storage tanks and a rain garden. Scott Hall is the new Nano-Bio-Energy Technologies Building for the College of Engineering and the Wilton E. Scott Institute for Energy Innovation at Carnegie Mellon University. The College of Engineering at Carnegie Mellon University is one of the premier research institutions at the forefront of advanced nanotechnology and complex engineered systems. 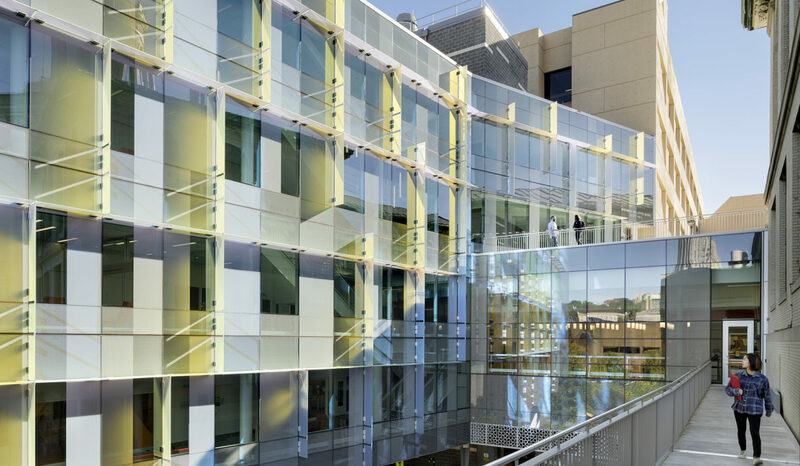 For Scott Hall’s curtain wall design, this gave us the opportunity to artistically reference the science and research taking place within the building while metaphorically linking concepts of nanoscience, scale, photons and light. Leveraging the inherently transformative nano-qualities of dichroic glass and ceramic glass frit with innovative glass fabrication techniques and a play on scale, we pushed the conceptual limits of glass as a material to create an evocative world of constantly changing color, texture and light, the perception of which shifts throughout the day with solar position, the seasons, and the observer’s position in space. Scott Hall is the new Nano-Bio-Energy Technologies Building for the College of Engineering and the Wilton E. Scott Institute for Energy Innovation at Carnegie Mellon University. Designing the facades has been a process much like doing a 3D painting, and during the design process we used digital and physical modeling to view the glass from multiple angles. By juxtaposing two color combinations of dichroic glass, a nanotechnology-derived material, we aimed to create a poetic beauty of geometric form whereby the glass comes alive in all lighting conditions with vibrant color in full sunlight to serene tones of pastels on overcast days. Our custom design of the silkscreened ceramic glass frit is based on an abstract geometric representation of a nanoscience photonic quasicrystal structure, which influences optical transmission and reflectivity, and the frit is composed of a dot matrix that shifts as one moves closer to or farther from the glass, where it is read as semitransparent vertical bands. Adding visual depth and color to the building, the dichroic glass and frit pattern create a bird-friendly building because they prevent birds from flying into the glass, a very important environmental aspect. In addition, the dichroic and frit artistically solved a technically challenging mandate. Scott Hall’s program includes a clean room for nanoscale research and numerous wet labs for biomedical engineering and energy technology research, which comprise over half of the building’s annual energy consumption. Thus the curtain wall is designed to meet stringent project energy efficiency goals. Sun-shading devices were required on the south and west elevation, and we took this opportunity to turn these components into a compelling work of art and weave them into the overall composition. The glass looks both ethereal and present yet in a timeless way. Scott Hall is the new Nano-Bio-Energy Technologies Building for the College of Engineering and the Wilton E. Scott Institute for Energy Innovation at Carnegie Mellon University. A challenging interstitial urban site with adjacent freight line inspired our conceptual response of two inverted spatial forms: the above-ground North Wing with strategically placed sculptural column-pods to accommodate existing utilities and road beneath and the Bertucci Nanotechnology Lab Wing, a below-grade low-vibration space replete with a contemporary state-of-the-art green roof atop to extend the landscape of the campus Mall. 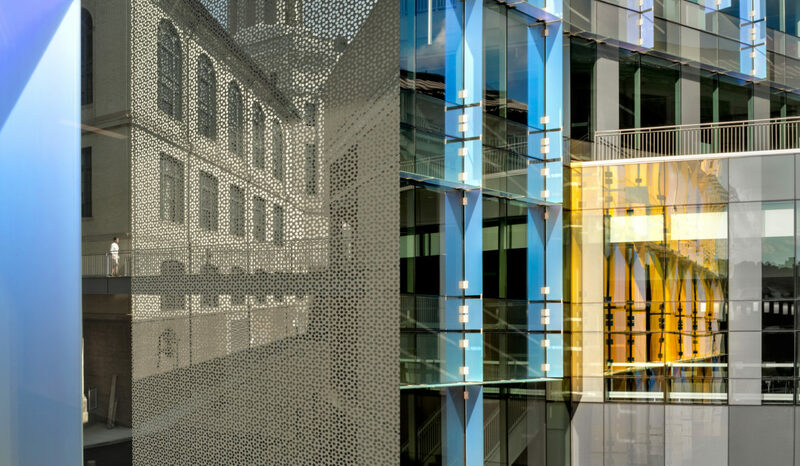 The forms embrace in a large public space with ephemeral light from a curtain wall incorporating dichroic glass, a nanotechnology-derived material, and ceramic frit geometrically representing a photonic quasicrystal nano-pattern. 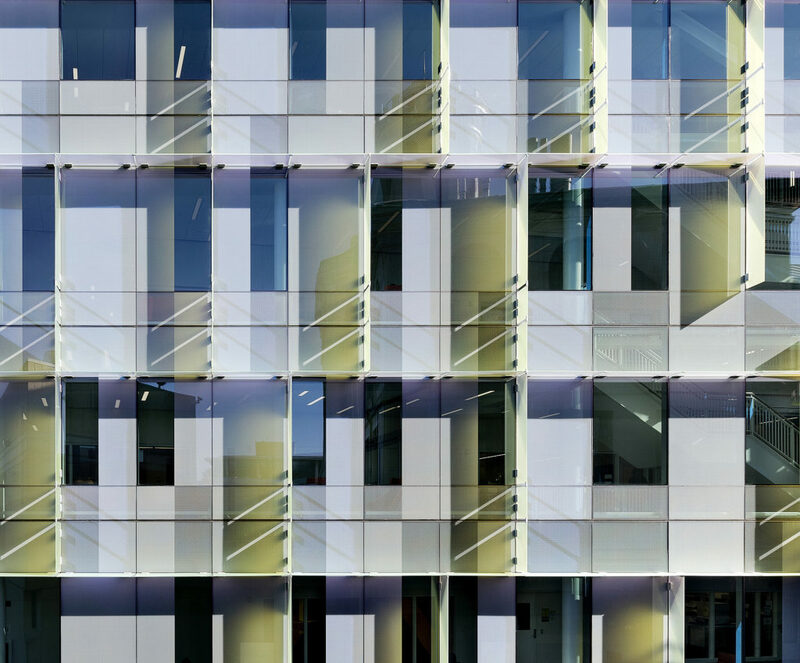 The element of light, reflected and transmitted, transforms the building into a dynamic interplay of dichotomous color and texture that shift throughout the day. It is a meeting of artistic material form and scientific innovation metaphorically representing occupant inspiration. 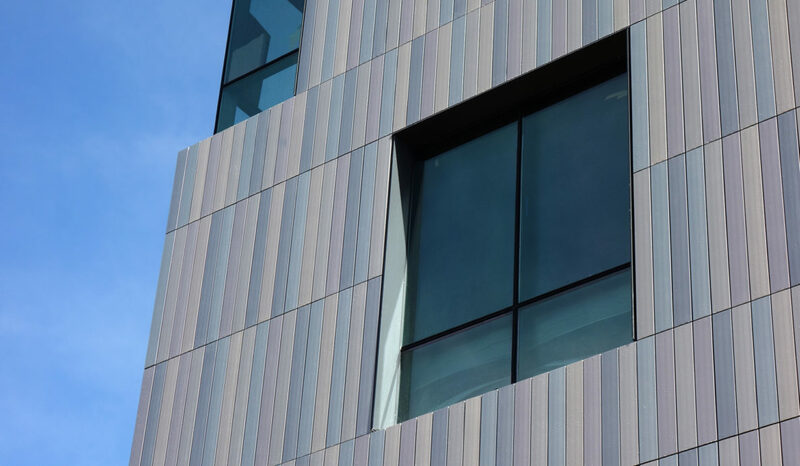 Detail image of the modern terra cotta cladding/rain screen façade for Tykeson Hall the new home and first-of-its-kind innovative academic center for the College of Arts and Sciences at the University of Oregon. This is the first building to have terra cotta incorporated into a design on campus in 80 years, melding contemporary geometry with a subtle color field of five custom glazes based on a palette of natural regional landscape colors. The appearance of the façade alters depending on weather conditions, with fields of subtle color attracting the natural light in their own way and lending the architecture a corresponding dynamic.